This page describes a few key points to know before you set up your Kinect sensor. Do I have to use Kinect with Xbox One? To get the full benefits of your Xbox One, we recommend using the Kinect sensor with the console. However, it's not mandatory. Select System > Settings > Kinect & devices. Select Kinect, and then select Kinect on or Kinect off. For more information, see How to turn your Kinect Sensor for Xbox One on or off. Like your console, the Kinect sensor needs room for the vents and fans to maintain an optimal operating temperature. Keep the area around your sensor free from clutter, and don't cover the vents. The face of the Kinect sensor has two cameras (one VGA and one infrared camera), as well as IR sensors. Much like the cameras embedded in some of your other devices, they work best when the lens is free from smudges, so avoid touching the front of the sensor. The Kinect microphone design allows it to hear everything in your play space. However, sounds from appliances, speakers, fans, or people talking can interfere with the Kinect microphone. In these scenarios, Kinect may not recognize voice commands. For more information, see Calibrate the microphone on your Kinect sensor. 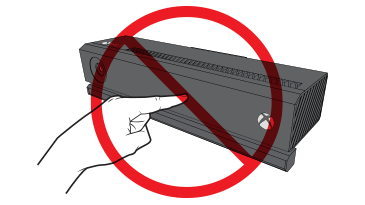 Follow the Kinect for Xbox One health and safety guidelines to safely get the most out of your Kinect sensor. Learn about glare, electrical safety, and more. Would you like to contact Support regarding the "Tips for setting up your Kinect with Xbox One" issue you were reading about or a different issue?